Bexhill United are a nightmare to play against once they’re in front, according to the football club’s manager Ryan Light. The Pirates are up to second in Southern Combination Football League Division One having won five and drawn one of their last six league matches. Bexhill, who trail leaders AFC Varndeanians by six points, possess the best goal difference in the division and are the highest scorers having netted 37 goals in their first 10 league matches. Light said: “When we get in front, we’re a nightmare to play against. As soon as they (the opposition) come out, we’re so good at getting in behind them. “Thirty-seven goals we’re made up with that and 22 points after 10 games we would definitely have taken that, especially the way we’ve played. Bexhill will seek to continue their fine form when they travel to bottom half side Oakwood tomorrow (Saturday). “The surface there is usually pretty decent and I think it will suit us,” continued Light. 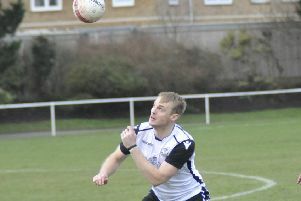 “It was probably the pick of the bunch out of all the games last year (Bexhill won the corresponding fixture 7-1). Chris Rea is unavailable and Connor Robertson is still away so Bexhill will field a third different right-back in three games.